FRA: Hi! Welcome to FRA’s Roundtable Insight! .. Today we have Charles Hugh Smith, author, leading global finance blogger, and America’s philosopher. He’s the author of nine books on our economy and society, including A Radically Beneficial World: Automation Technology and Creating Jobs for All, Resistance Revolution Liberation: A Model for Positive Change, and The Nearly Free University & The Emerging Economy. His blog oftwominds.com has logged well over 55 million page views and is number 7 on CNBC’s top alternative finance site. Welcome Charles! Charles: Thank You Richard! I hope I live up to that very nice introduction! FRA: Oh you always do. Thank you for being on the show! And so I think today we wanted to do a bit of a change and look at the economy as a whole and some very interesting trends that are happening, namely a software automation and robotics process automation and artificial intelligence and how that is changing the economy, the job market, how organizations are being affected by these changes, what are they doing, and if people cannot be redeployed elsewhere within our organization, what’s the answer? Do we do a lunar Apollo crash program or, you know, just some of your thoughts on that? And just like to point out so you’ve written a book on Radically beneficial world on automation technology and creating jobs so that could be quite relevant here and also a number of articles as well. Charles: Right! Right! Well this is a fascinating topic to me Richard and so I spent a lot of time trying to get up to speed on it and of course it’s evolving so quickly that those of us that aren’t really in the field, we’re always trying to play a little bit of catch up so I’m not claiming to be cutting edge here but I think I have thought a lot about it and tried to help my readers navigate it. So, I would start with what’s the context of automation, and robotics, and AI, the impact on the economy as a whole? And I called it, this whole sector trend change, the “emerging economy” because it hasn’t yet occupied every sector of the economy but we know it will right? So that’s why I call it the emerging economy. We see it everywhere but it hasn’t yet, it’s still quite a ways from fully manifesting in every sector of the economy. And one of the issues that you raised here is what happens if we can’t employee people in a sustainable fashion at a relatively high rate of pay? Then who’s going to be supporting the consumer economy? Right? In other words, the basic answer for a lot of people is we give everyone universal basic income but that’s like a $1,000 per person per month is for the general gist of that. That’s not the equivalent of a real middle-class job. That’s just survival pay so that’s not really gonna solve that issue. So that’s one issue and that’s I think the impotence behind your question. We really need people to be working. Not only because we need their productive and capacity but we also have to give people a way to generate enough income to have a good life as prices continue to rise and so on. FRA: Yeah exactly and what’s happening here is generally technology companies will be able to transform an organization or provide some assistance in the areas of software automation robotics, process automation, and artificial intelligence. But what happens is after some work through organizational change management, they’re able to identify other areas of the organization where those affected by the job changes can be redeployed elsewhere in the organization but it doesn’t work for everybody. Some cannot be redeployed elsewhere within the organization and so they would be let go and then it becomes a societal problem or a government problem at that point. So that’s the big question what happens at that point? Charles: Right! Just to provide some context, I have assembled a few graphics here that will help us, I hope, contextualize your question. 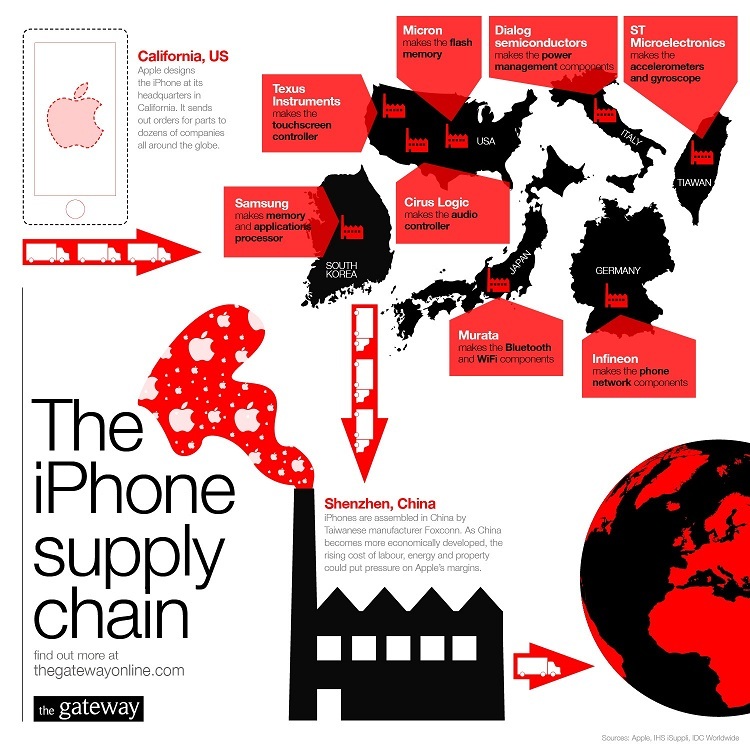 The first is the iPhone supply chain, which goes to show just how global the tech economy is. Now of course, this is not the entire economy because I read somebody noted recently on the internet that you can’t get a haircut on the internet. Right? So my point here is with the iPhone supply chain is to show that automation is a global phenomenon right? Their automating in China despite the lower labour cost because the labour costs is rising there too. So it’s not just an advanced economy problem, it’s global. And my next chart here is the labour share of the GDP. In other words, how much of the gross domestic product (inaudible 6:01-6:02) how much does that end up in the hands of labour as opposed to capital or other investment? 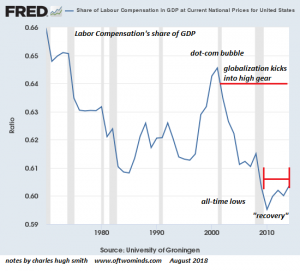 We can see from this chart that labour share rose considerably in the dot com era because there was a huge expansion of employment to build out the basic infrastructure of the internet and so that created a lot of real employment. 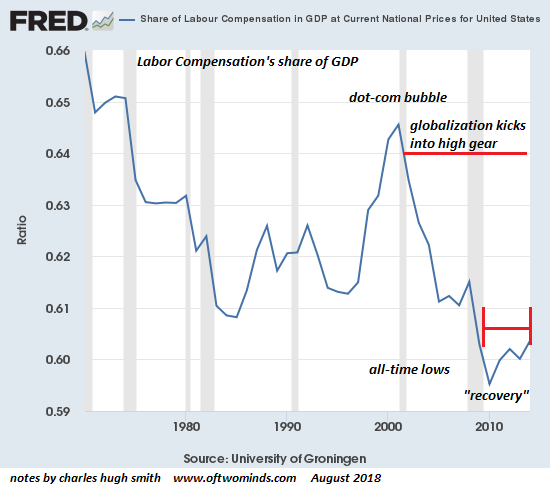 But when that got built out then the labour share of the GDP plummeted and it hasn’t recovered despite the so-called global recovery. So my point here is to show that we really need to keep labour share of the GDP high enough to support consumption or else the model of our economy no longer works. 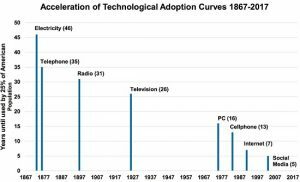 My next chart is the acceleration of technological adoption. Of course we all feel this intuitively but this points out that it took like 26 years for television to become ubiquitous and then it took social media only 5 years. So this puts a lot pressure on individuals and organizations because we can see this trend of automation is speeding up. It’s accelerating. It’s almost like whatever skill you learned in college, if it’s 4 years later, you’re already behind the curve. 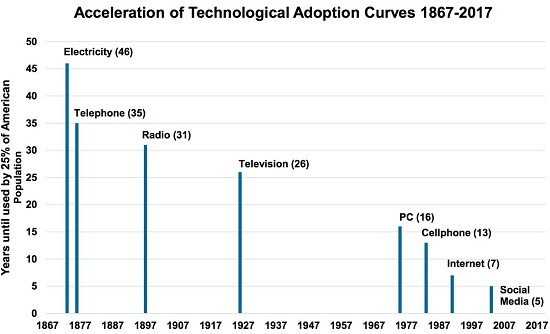 It requires, more or less, constant learning because of this accelerating adoption rate. Although we’re talking about the economy as a whole, I have a graphic here of the United States which is an example of an advanced economy, you could call up a map of China or Japan or Europe and have a similar discussion. The so called creative class, sort of the generalized term for people with higher education degrees and experience in the emerging economy, these of course are clustered in certain areas. So we’re really talking about two separate economies. So when we try to answer your important question, what do we do with people who aren’t able to transition to an emerging technology kind of economy? 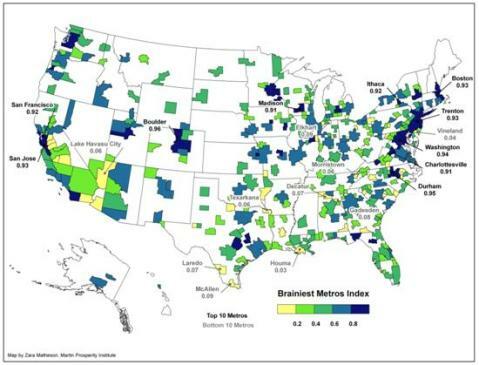 It’s a regional thing too because obviously the places like the San Francisco Bay area and equivalent places have the human capital, If you will, to address these issues better then areas with a less educated, with less mobile kind of employment foundation. My next chart shows, this is in the health care sector in the United States which we all know is troubled for a lot of reasons, that the number of physicians have been added to the sector is minimal in the last 30 to 40 years where the growth of administrators is up about 3000%. 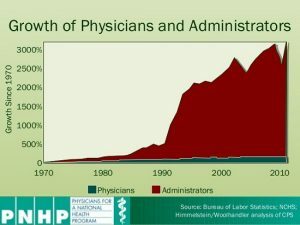 So I bring this chart to our attention as an example of a sector that is obviously ripe for disruption and there’s a lot of low-hanging fruit in terms of work that could be automated or streamlined in sectors like health care. In other words, this is not just high tech like we’re not talking about chip design or social media or mobile apps, we’re looking at these very large sectors that employ millions of people which are ripe for disruption by the forces that we’re talking about here. 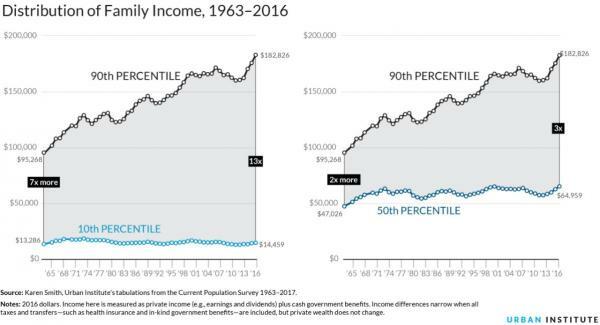 My last chart is distribution of family income which shows, that as we all know, the top 10% has basically lifted away from the bottom 90% in terms of income. The reason why I bring this up is, there is a lot of reasons for that, but one of them is that this top 10% tends to be the most highly educated, the most dynamic sector of the population. They’re the ones that are acquiring the skills and managerial skills to navigate the emerging economy and this is reflected in their much higher income. And this is the danger of a what we’re talking about here is even if we can maintain some generalized employment, if most of the rewards are going into the top ten percent then that also called into question or our whole mass consumption model of our economy. Now having said all that, how are organisations being affected by this change and how is it affecting the job market and how do how do organizations take the initiative to redeploy or train resources affected by these? These are all excellent questions and of course it depends on the sector. Say, just to give a brief example, the construction industry. There’s a certain amount of technological innovation there in terms of components fabricated in a factory and then shipped and assembled on site to reduce labour but there’s a lot of, let’s say, remodelling work. It’s very hard to automate that kind of stuff because it’s unique to each particular dwelling or each project and we still need workers with multiple skill sets. So I think as a general rule, what we want to train our people for, whether there within our organization or if their students or laid-off workers is we want to give people a menu of skill sets not just a specialty. I mean a specialty skills works great if you are designing really high-end chip sets or you’re a physician but like for the rest of the populist, specialization means that you can be replaced by automation a lot easier than if you can have multiple skills. That’s one issue here is that we want to broaden peoples skill set. Another thought here is that some labours are hard to automate like creative work, design, editing, etc. But even those kinds of advanced skill sets are being are being automated too as automation eats its way up the food chain. Another sector of work that’s fairly protected is managing people, you know managerial skills which is really hard to automate and also any kind of employment that’s based on high touch. What’s known as high touch, meaning that your interacting with humans is what creates the value of your employment and so of course it’s going to be like nursing and childcare and so. I think what we’re really talking about here when talk about how to organization responds, we’re talking not about those professions that are very difficult to automate but we’re talking about the professions that have to work with automation. They may not be completely replaced but it demands the employee’s augment the processes and learn enough to increase productivity because that’s another thing we’re talking about here as automation and A.I spread throughout the economy, we’re finding productivity is still stagnating. So we’re not really getting the gains of that. I mean you must have some thoughts about that too right? Because technology is supposed to enhance productivity. That’s the wealth creation part. FRA: Yeah, and you’ve also explored in recent writing as well how organizations are being affected by these changes. Not only as you just mentioned on the productivity results but also on profits. Can you elaborate on that? And in recent writings, you mention that the automation doesn’t just destroy jobs, it destroys profits too. Charles: Right and that’s counterintuitive for a lot of people Richard because they assume that the robot, because it’s replacing human labor and it’s cheaper, that it’s kind of generate huge profits or the other company that replaced their employees with robots but it doesn’t work like that and the reason why is “commoditization”. When we commoditize something, whether it’s labour or capital or goods, it means that they’re interchangeable. They can be produced anywhere in the world and so this is what the globalization phenomenon has (inaudible 15:41) why it’s reduced cost so much is labour is interchangeable, computer chips are interchangeable, computer design centres are interchangeable so a robot is like a good example of a commoditized tool where anybody can buy the same robot that I bought and they can put it on their line. So therefore where’s my scarcity value? Where’s my Competitive Edge? and so as soon as you get robots involved then profits fall because everything becomes a commodity and we can see this in technology that when something is commoditized, the value drops, the price drops, and the profit margins drop to near 0. Like for instance a tablet. Right now if you have the special software that Apple sells right it’s tightly bound to its Hardware, that’s their scarcity value you can only get the certain features that Apple has by spending $400 on an iPad right? But if you’re going to get a generic tablet, those are like 30 bucks a piece in China with free software loaded and they have to have an 80 or 90% of the capability of the more expensive one. That’s the same thing that’s gonna happen to robotics. Everybody can buy the same Robotics and a lot of the tools why automation are free or software they’re free or they’re very cheap. So that’s why profits are going to plummet as automation enters the supply chain. FRA: Interesting! And in terms of how organizations are addressing this, I think it’s also interesting to note how you can almost divide the pool of resources into some certain scenarios. One is the resources that need to be trained for extra skill sets on how to manage the increased level of automation or robotic process automation or artificial intelligence that will come into play in the organization. And then there’s others that would need to be redeployed within the organization elsewhere overall increasing productivity in that way. And then there’s the pool that where there’s no opportunities identified. They are not able to do increased levels of activity of services and they’re not in the pool of being able to be redeployed elsewhere. Your thoughts on that? Charles: Right! It’s an excellent point Richard and this was really why I wrote my book A Radically Beneficial World is what I was proposing was that there is a very large pool of workers who don’t have the value system, the ambition, this sort of background perhaps to take on the extreme challenge of learning a bunch of high technology skills sets. And of those people, many of them have other kinds of intelligence. In other words, we need to help people identify where their strengths are. So for instance, some people have great manual intelligence. They can work with very fine machinery, some of which is of course related to robotics. FRA: Now what can we do about this? Should governments take a role in redeploying or training resources affected by these changes? So that this would be the pool of resources that are unable to be redeployed within the organization or that’s still continued to have an expanded role in their current positions and job functions. So what can government do in this regard? Does it make sense to have government play a role your thoughts? Charles: That’s a great question Richard and I think we can discern two approaches here. One is direct government spending, like on infrastructure a lot of people think of that, but it’s also the government could streamline a lot of really clunky processes we have now and in it (inaudible 20:21-20:22) both have, you know, a lower-level high school education and also higher education. So there’s opportunities for the government to contribute to the solutions in two ways; simplifying and enhancing processes that’s already involved in and then direct spending. FRA: What about Reliance on the Invisible Hand of Adam Smith? So you know would that play a role here in terms of inner resources able to self-identify or self-train into other areas of the economy? Charles: Right, it’s a great question and it’s always an issue I think in a state market economy which describes most of the global economy now right that the government’s around the world are heavily engaged or involved in managing their private sector. And so a lot of people have a sort of Quasi-religious belief that the market can solve everything but there certainly seems to be examples in which government does need to play a role in terms of providing infrastructure for everybody so that everybody has equal opportunity within a society. It’s something that isn’t necessarily profitable for enterprise to supply those things. Sometimes it is, sometimes it isn’t right? The canals in the early of the 18th century in America were privately-funded. But to use the example you mentioned earlier the Apollo Mission to the moon, obviously there was no a market demand for that and so no one was going to put up money or capital because there was no profit to be earned and because there was no market. In my book A Radically Beneficial World, I talk about the community economy as a place where we, the government, could redeploy capital because there’s lot of work to be done in local communities (inaudible 22:47 to 22:48) do the work because it’s just not profitable enough for them. But governments are often heavy handed and there are a lot of programs like job training end up failing. They don’t produce desired results. That’s not a clear answer but I think there’s multiple levels of opportunity for government. Sometimes just providing some infrastructure, sometimes smoothing the path so that work private capital can get to work without a lot of red tape and regulation. FRA: And what about the lunar Apollo crash program back in the 1960s? There’s estimates that perhaps somewhere between $4 and $8 in economic growth, economic activity was generated for every $1 invested into that program. So maybe could that be considered in terms of doing another crash type of program but in something else that makes sense today like you know nuclear fusion energy development coupled with the electrification of cars for example. Would that make sense it in create jobs not only in the white collar jobs but also blue collar jobs across the entire nation? Charles: That’s a great question Richard. I think a lot of people are looking to that idea as a major solution. A big government spending program on something that was particularly useful, which would be energy, because we all know we need to transition away from fossil fuels. There’s a cautionary part of that idea and I looked to Japan as an example of the cautionary part. Japan has spent almost 30 years spending a tremendous amount of fiscal stimulus on infrastructure and what they done is mal-invested much of it in bridges to nowhere and high-ways very few people used and this is a result of their political system which gives a lot of power to the construction industry. Sadly, they in my view, they squandered trillions of Yen on infrastructure that really didn’t serve the entire citizenry as well as if they solarize their economy or done something that was more to the common good instead of just kind of make work projects. So we have to be careful here that we’re not just funding make work jobs, we want to leverage some technology that benefits the greater good. One example, and a lot of people talk about this, is upgrading the electrical grid because this is something that is required in order make use of electrical production from solar and wind. It’s increasing right? That grid has to be completely upgraded. So that’s an example of a program that sort of fits those parameters so that it would leverage government investment to the benefit of the private sector as well as to the citizenry. Of course everybody loves the example of the Arpanet, which was the original little government funded program that spawned the entire internet right? That was a really low cost investment and so I think we can talk about that too like it’s easy to talk about spending a trillion dollars, and everybody wants to spend a trillion, but maybe we should start by just trying to see what we could do with smaller sums to leverage new technologies and make them available to a wider range of people like 3D fabrication technology. That could be beneficial if the government invested in spreading that around and that should be a lot less expensive than big trillion-dollar programs. FRA: Interesting. And finally how do you see all of this playing out in the long-term? Do you see like a combination of government taking a role, the invisible hand of Adam Smith or potential crash programs in the future? Charles: Right! It’s a very dynamic situation and I would hesitate to make any predictions but I think the potential for disruption is so large that the government itself should be disrupted. In other words, we need to disrupt, to which we apply the technologies that we were discussing. We need to apply them to lower the cost and increase the effectiveness of government itself. And so when we talk about government spending, one of the first places we should invest in is streamlining government because it’s really, and it in so many ways, inefficient and ineffective and it desperately needs to be disrupted in streamlined. So that that might be a first place to start investing taxpayer money. FRA: Wow, great insight as always Charles. How can our listeners learn more about your work? Charles: Yeah, please visit me oftwominds.com, and you can read samples of my most recent books. FRA: Great! Thank you very much for being on the program show for your insights on this very interesting topic. Charles: Oh yeah, we barely touched the surface. Thank you so much for inviting me on the program!